The transformation of health care is underway. The health care workforce is also changing to meet these new challenges and others, including an aging population, better care coordination and integrating behavioral and physical health care. Though the endpoint is ever-evolving through innovations and disruptors alike, leading hospitals and health systems are identifying new metrics for success, expectations for capacity building and new requirements for culture and talent. Collaboration, peer-to-peer education, and the sharing of best practices will help move the field in the right direction. Bookmark this page and check back periodically for the latest resources to inform your strategy. Gain insight about market forces and trends — including workforce issues — that are likely to affect the health care field. Based on research from some the field’s most trusted sources, this comprehensive report will help you better understand the challenges and opportunities facing health care HR — how they’ve changed over the past year, and how you can expect them to change in the future. This informative report explores the health care job seeker journey and provides you with valuable insights that can be applied to your recruitment strategy. A review of the new roles that reflect hospitals' expanded mission of both caring for the sick and promoting health and wellness. Tips from progressive hospitals and health systems on how they drive employee engagement, satisfaction and loyalty. Results from a recent survey of what job seekers in health care are looking for — and where they're looking. Building on previous Workforce Center resources, this paper examines workforce-specific roles, responsibilities and technologies for hospitals and health systems to consider as they embrace new value-based care delivery models. As annual premiums for employee-sponsored health care continue to rise, one proven solution not only reduces costs, it also improves employee health and wellness. Employee wellness programs have become a mainstay in corporate culture, although they stop short of providing true clinical and financial results. Technology advances have made it easier for individuals to forge their qualifications. This white paper summarizes The Joint Commissions primary source verification requirements. Brochure Content provided by AHA Endorsement: The Allen J. Flood Companies, Inc. The Volunteer and Student Nurse Insurance Program insures hospital volunteers and student nurses who are injured while performing authorized hospital volunteer and student nurse activities. This whitepaper examines the process of expungement, or the sealing and pardoning of criminal matters, and its implications. This infographic offers data points to wellness success against heart disease. Learn how a results-driven wellness program can be the foundation for positive health changes in hospital employees. Strengthening engagement levels leads to happier employees who are satisfied with their jobs and stay longer, which leads to better patient care and satisfaction. Learn how to build engagement. 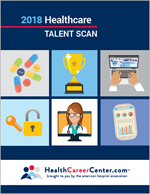 How have health care field changes affected talent management practices? Survey findings highlight challenges ranging from recruiting high-quality employees to training and retaining them over time. As a dedicated resource to helping hospitals achieve the Triple Aim, AHA Solutions has partnered with Interactive Health to help our hospitals improve their employee's health, as well as their bottom line.